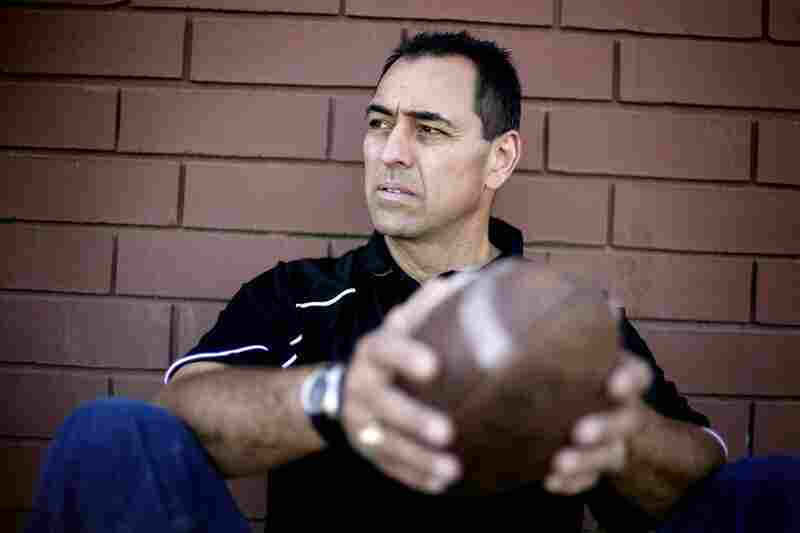 A Brain Battered By Football The years of hard hits have left former NFL player George Visger with severe memory loss. His doctors warn his brain problems could get worse quickly. While he struggles with his short-term memory, his days as a star high school lineman are vivid and special. 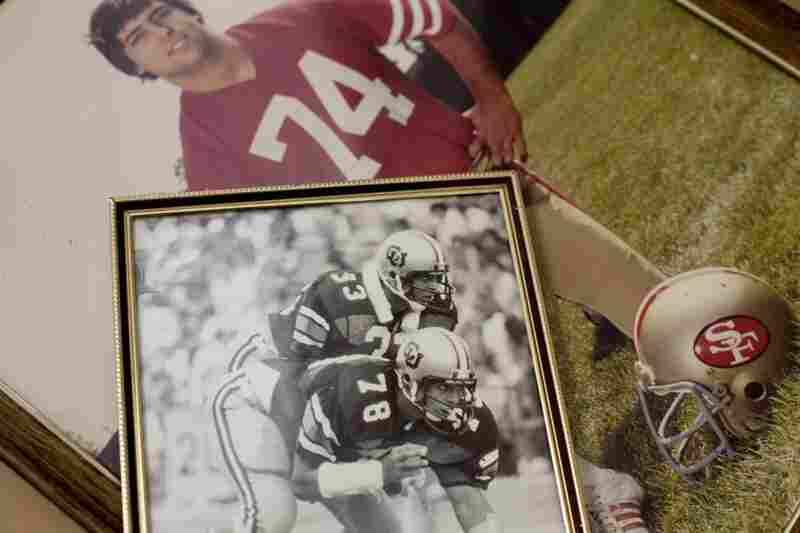 George Visger, 51, who played for the University of Colorado Buffaloes and the San Francisco 49ers, has severe short-term-memory loss due to numerous head injuries. 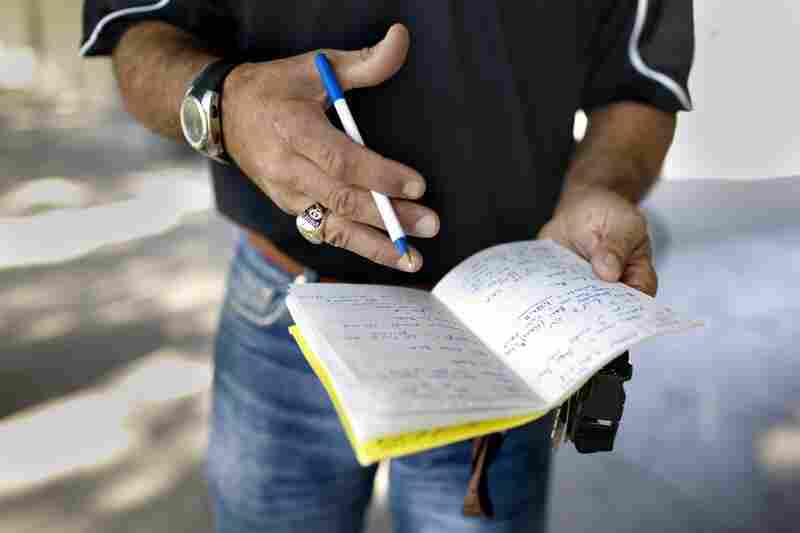 Visger keeps a yellow notebook with him as a memory aid. He says he has about three boxes full of notebooks dating back to 1990. Visger talks to football players at his alma mater, Stagg High in Stockton, Calif., about success on the field and in the classroom. Visger was No. 78 on the University of Colorado Orange Bowl team in 1977 and No. 74 on the 49ers 1981-82 Super Bowl championship team. Despite short-term-memory loss, Visger retains a good long-term memory. In the weight room at his former high school, he recalls weightlifting competitions he had with teammates. Visger participates in this year's Stagg High School homecoming parade. Visger shares high school football stories with his friend and former Stagg High teammate Alex Zanini. Visger say there are years of his life that he doesn't remember at all and that his friends "laugh that my head is like a bowling ball" given all his surgeries. 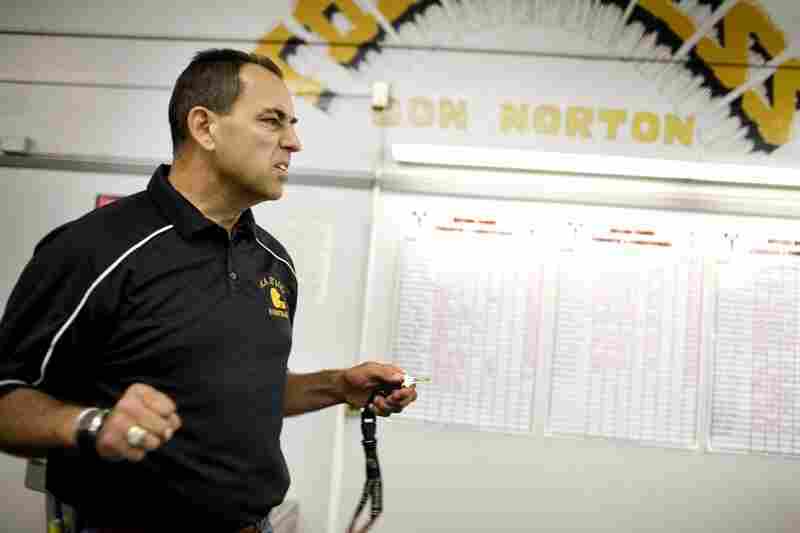 High school football left an indelible mark on George Visger. At 51, he's a man whose high school football experience decades ago remains vivid and special — even though the game itself has left a dark cloud over his life. Visger, who played college ball at the University of Colorado and then joined the San Francisco 49ers, has a brain battered by football. The years of hard hits have left him with severe memory loss and other brain problems, and his doctors warn they could get more serious quickly. On a recent warm, autumn Friday in central California, Visger slid into his 2003 silver Dodge pickup truck and set out from his home in Grass Valley to Stagg High School in Stockton two hours south. It also takes Visger 35 years back to when he was a star offensive and defensive lineman for the Stagg Delta Kings. "I get goose bumps going down there every year," Visger says. Goose bumps, tears, laughter. It all pours out when he makes the journey back — be it in his truck or in his mind. Here's a guy who played in a college bowl game, who was a member of a Super Bowl-winning NFL team. But it's the stories about Stagg High that Visger loves to tell with crystal clarity and passion. Especially from his senior year — 1975 — when the Delta Kings were ranked third in all of California and No. 1 one in each other's lives. "Probably fully a third of our team was from single-parent families and had gone through all types of adversity," Visger says. "It was an incredible group we had. We just turned to one another." Never more so than when the father of running back Fred Douglas was murdered the week of one of the biggest games of that 1975 season. The entire team went to the funeral on a Thursday; no one expected Douglas to play on Friday, right up until the moment he appeared — minutes before kickoff. "I'll never forget," Visger says. "[Douglas] comes in the locker room, and he's got his bag of gear over his shoulder and all he said was, 'I just thought you boys might need me tonight. I couldn't let you down.' "
Visger eyes tear up as he talks about the memory. "I'm telling you, it's hard for me to even talk about it 35 years later without getting emotional. There wasn't a dry eye in the locker room," he says. Visger's eyes are dry by the time he arrives at the Stagg High practice field — not that it matters really, because the players he meets on the sidelines aren't looking in his eyes. They're ogling the rings on his fingers. On Visger's left hand, there's one from the 1977 Orange Bowl when he was a starting defensive tackle for the University of Colorado. On his right, a diamond-encrusted 1982 Super Bowl ring from when he was a member of the San Francisco 49ers. Visger wears them for occasions like this. He calls them his "business development" rings. He's been asked to speak to the team after practice, and the jewels are the hook: the way to get a bunch of teenagers to listen to a 51-year-old man talk about goal-setting and doing well in the classroom. His speech is laced with vivid memories of decades-old high school glory. The cruel irony here, however, is when you spend time talking to George Visger, life often is anything but vivid. "Today when I was at the, ummmm, I think it was today. It was today right? When I was at the, when I was at the TV interview. I'm trying to remember. It was today, right?" Visger laughs — he just can't get back his train of thought. Laughter is one of his coping mechanisms for the memory lapses. His short-term memory has been dwindling — rapidly. Small, yellow notebooks serve as another coping mechanism. They're a lifeline, really. Visger takes them everywhere. He pulls one out of the back pocket of his Levi's and starts to leaf through the pages. They're his memory — a daily log of conversations that otherwise would be lost. Visger's first concussion was at 13. His coach at the time had the players do a drill called "bull in the ring." Two players would line up on opposite sides of a circle. There was a ball in the middle. When the coach blew the whistle, the first guy to the ball won. Visger says it was a totally unnecessary "gladiator drill." "We just put our heads down and ran at each other full speed from 25 yards," Visger says. "Top of head to top of head, which, you know, was crazy." Young Visger was then knocked unconscious and hospitalized. The definition of concussions has changed over the years. Now episodes much more benign than a loss of consciousness are labeled concussions. By that standard, Visger estimates, he has had hundreds if not thousands of concussions during his 12 years playing football. In the early 1980s, Visger says team doctors for the San Francisco 49ers told him his episodes of pounding headaches, projectile vomiting and temporary loss of vision and hearing were due to high blood pressure. When asked about what ended up being a misdiagnosis, a spokesman for the current 49ers said it wasn't proper to comment since they had no firsthand knowledge of Visger's medical history. What the team doctors initially called high blood pressure, though, in fact was a condition called hydrocephalus, where excess fluid accumulates in and around the brain. Since then, Visger has endured nine brain surgeries, a number of lengthy and terrifying seizures, and was even given last rites during one emergency hospitalization. His first brain surgery, when he was with the 49ers, prevented him from playing in that 1982 Super Bowl. But he still got a ring. Back in the pickup truck, Visger drives a few of the Stagg High School players to their homecoming parade in downtown Stockton.The conversation turns to concussions, a topic in the news every football season it seems. The boys say they've never had any concussions, at least by their definition. Stuart Belille, an offensive tackle, says, "when you hit someone, there's always like sparkly things [in your head] if you hit 'em hard enough. And that's a pretty good feeling because you know you got 'em." Listening as he drives, Visger replies, "You know, those are mild forms of concussion now. It's what they're considering concussions. Back when I played, it was you were either unconscious or stumbling around." It's one of just a few references Visger makes about the brain-injury part of his story. This is a goodwill trip to Stagg, after all — a celebration of homecoming and the then-undefeated Delta Kings. Plus, Visger's case is extreme. Not every kid who has a concussion will go down the road Visger went. According to concussion expert Dr. Stanley Herring, "concussions are remarkably individual." Concussion treatment and management certainly have improved since Visger's high school days as well. Still, statistics show that male football players get the most concussions among high school athletes. 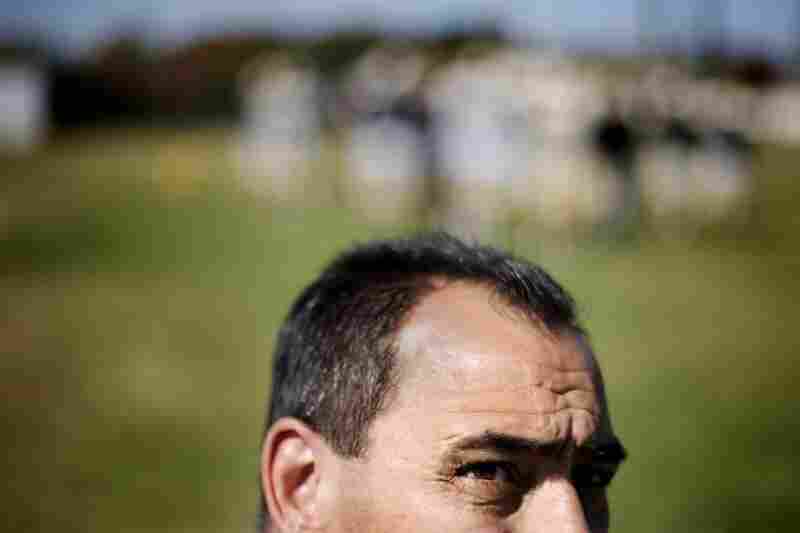 The players at Stagg say they know the risk — as much as teenage boys can know risk. "You love football, and it doesn't really matter what happens. Just go after it," says Shawn Mayo, a senior defensive end. Those are the kinds of football attitudes that Visger used, over the years, to shrug off his health problems. But lately, he's been worried. The symptoms have been getting worse. And it's not just his memory. He's getting more easily distracted. It's taking longer to finish the reports he prepares as a wildlife biologist. And Visger's biggest fear: flashes of anger that are taking a toll on his wife, Christy, a schoolteacher; and his young children. "My wife works her tail off at school," says Visger. "She'll be there until 10, 11 or midnight sometimes. My kids are staying there with her now sometimes, almost that late. Christy's telling me now they're afraid to come home with me." In late October, Visger traveled to Southern California for an extensive brain evaluation. The news was not good. Dr. Daniel Amen, the neuropsychiatrist who studied Visger, said the football player's brain is damaged to such an extent that he'll get dementia in the next five years if they don't try to reverse his condition. Visger understands that prognosis but he says he is extremely enthusiastic about Amen's treatment plan. It's a combination of improving Visger's sleep habits — he suffers lengthy bouts of insomnia — along with introducing more "brain healthy" nutrients in Visger's diet. Amen is also figuring out the right medicines for him to take. Still, Visger admits a sense of urgency in wanting to accomplish things now, such as raising awareness about hydrocephalus, promoting concussion education and speaking on behalf of other NFL retirees with long-term health problems. And of course, loving Stagg High School football. In November, Visger will return to Stockton and cheer for some old teammates as they're inducted into the Stagg High Hall of Fame.